APPLICATION: The front panel of the RC2-ST features two pushbuttons with two associated LEDs. Upon initial power-up, source 1 is selected. Touching the other button de-selects source 1 and immediately selects source 2. An LED adjacent to each button shows which source is selected. In a typical installation, the RC2-ST may be used to select between two audio or video sources, or to route audio to two destinations. 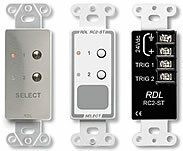 To select between two audio sources, the RC2-ST is connected to an RDL ST-SSR1 Solid-State Audio Switch. For video switching, an RDL TX-MVX may be used. 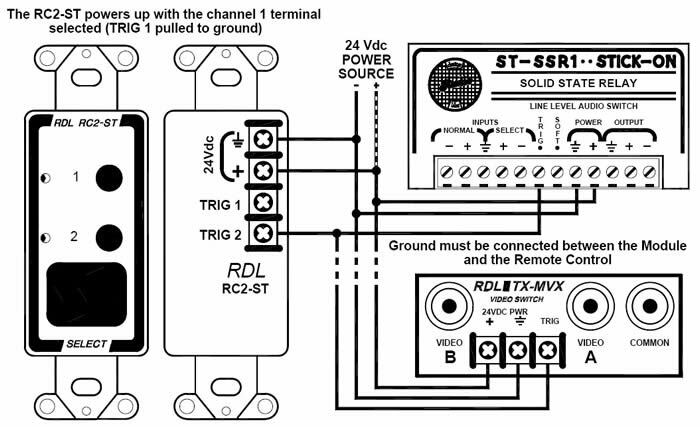 For audio routing, an RDL ST-RX2 is used. In each of the above examples, only one output terminal is needed for triggering. Therefore a single shielded pair (or 3-conductor cable) is required for remote connection. For more complex switching networks, both outputs may be used. In installations where ULTRASTYLE™ wall controls are preferred, use the RUC-4 Universal Remote Control.